At the top of Buran Theatre’s Magic Bullets, the cast enters singing in a serene choral processional. It’s a brightly composed number that somewhere down the line probably owes a debt to Stephen Schwartz’s Godspell; it’s all about being the “light of the world.” This pious tone continues for a while. But then the register shifts, the music transitions abruptly, and all of a damn sudden they’re signing Now bring me some figgy pudding from “We Wish You a Merry Christmas.” Pretty soon it’s nothing more than a squawking circus of entitled hysteria. This startling transition from high-minded piety to wildly regressive narcissism – by way of a random Christmas carol, no less – is kind of a perfect thesis statement for Buran Theater and the disjointed conversation they want to have about health and wellness in Magic Bullets. 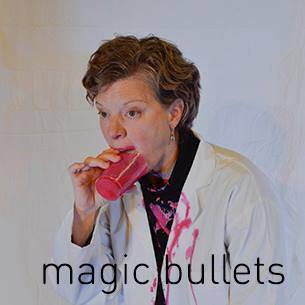 Since I will not be attending the full production of Magic Bullets, which ends its run at Incubator Arts Project this weekend, out of fairness to the company I will not be putting out a formal review. 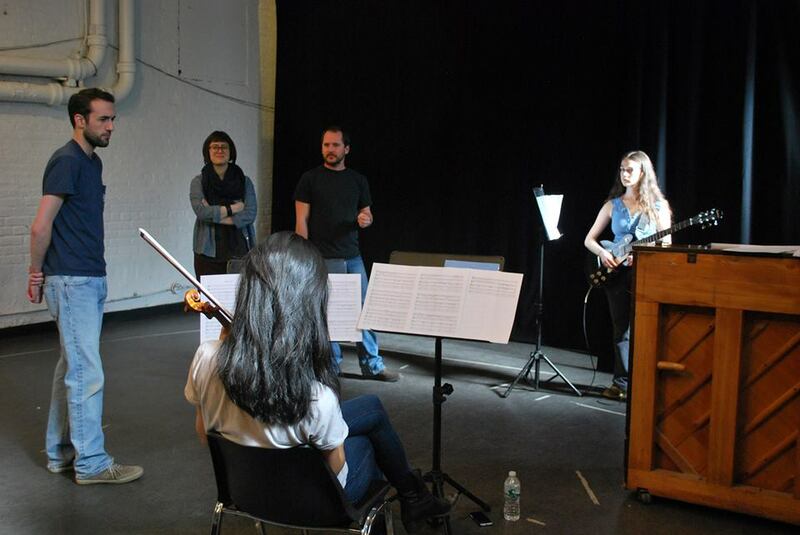 I did however want to follow up my Pre-Game post from last week with a few brief thoughts on the “in-progress” performance I was invited to by Buran’s co-artistic director, Adam R. Burnett, who wrote and co-directed the production with performer Jud Knudsen. When I say “in-progress” I mean just that – this run-through took place at HB Studio with the extremely charming cast in rehearsal attire. There were no sound effects, no lights, and only minimal props. Music was provided by three multi-tasking cast members and Burnett’s iPod. I’m pointing all this out so that we can be crystal clear that my remarks here do not refer to final production currently running at Incubator; what I saw was just a sketch of the eventual end product. I found the experience of seeing this unfinished version immensely illuminating; even in this raw form, the company’s signature rambunctiousness was fully in evidence. Case in point: the figgy pudding. As with most of Buran’s work, what seems like an utterly haphazard transition is actually the point of the thing. When everything is normal, people tend to have a very noble, if ambiguous, view of health and staying well. If you and yours are doing okay, there’s plenty of good will to go around. But the moment something comes up, even a minor medical issue, the claws come out and it becomes a vicious battle for resources. We demand immediate attention, immediate treatment, and immediate results – most important we demand to be moved to the front of the line. Our needs must be met first. We are ravenous for care, like petulant children demanding more dessert at Christmas dinner. 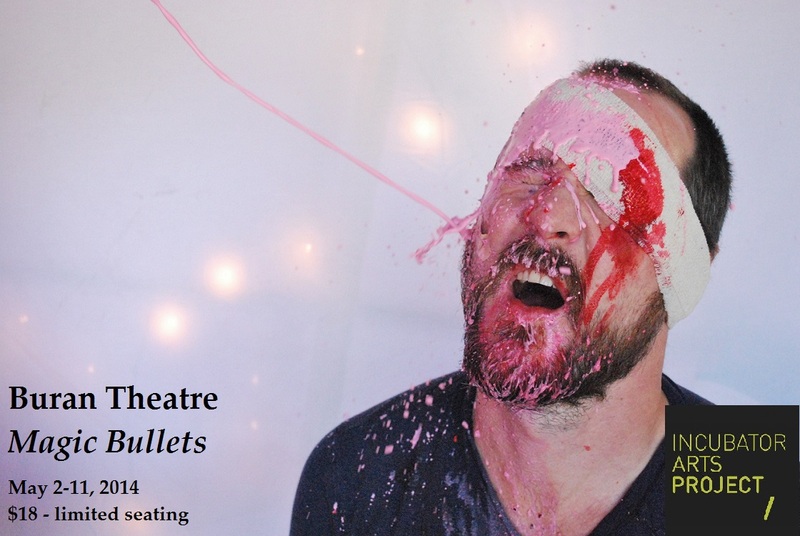 With Magic Bullets, Buran uses rollicking music by Casey Mraz, loose narrative, and Gallagher-level food splatter to explore this disconnect between the vague egalitarianism and the voracious desperation we feel when it comes to health. The centerpiece of the production is a spirited song that fetishizes the mixing of fruit shakes. The version I saw was just a placeholder, but in the full version the cast jovially mixes up juice in blenders, sloshing and splashing the multi-colored liquid all over the place. I’m sorry to have missed this surely explosive number, and even more sorry to have missed seeing it at Incubator. Incubator will be closing this summer, and this sort of exuberant madness is exactly what I will always love and remember about that venue. In his curtain speech for the performance, Burnett said the initial notion for this production began with the idea of doing an adaptation of S. Ansky’s 1914 play, The Dybuk, in which a young woman is possessed, and then performing some kind of exorcism on stage. Burnett says that these initial ideas were quickly abandoned, but I don’t necessarily agree with that. Like the “Juice” in its signature number, Magic Bullets is a dense puree of influences and cultural flotsam. That early stuff found its way into the mix somehow, because it sure feels like there’s a full-blown exorcism going on. I can’t say if this insanely fun ritual purges that base instinct for self-preservation – the “Figgy Pudding Drive,” as it were – or satiates it, but either way you definitely leave Magic Bullets feeling cleansed. Next Next post: WHY SO SAD, BATMAN?